Collage Maker is a tool that simplifies the process of building photo collages. Create eye-catching collages quickly and effortlessly. Select a group of photos and let Collage Maker generate the collage according to your preferences. The Auto-Collage Templates let you create interesting collages by arranging the photos in various layouts. Use Collage Maker to apply various mask and halo effects to your photos for a professional look. Collage Maker is a tool that simplifies the process of building photo collages. ...... Rubber Stamps, and Masks. Gradient Color Effects, Custom Rotation, and Text Editing are also included. Print your collages on your printer or have them professionally processed at a digital photo centern. There are over 80 Holiday and Theme Templates that can be used to build collages quickly. Photo placeholders appear on the template where photos can be inserted. Select a collection of photos and then use the Auto-Collage feature to tile the photos using various customization options. 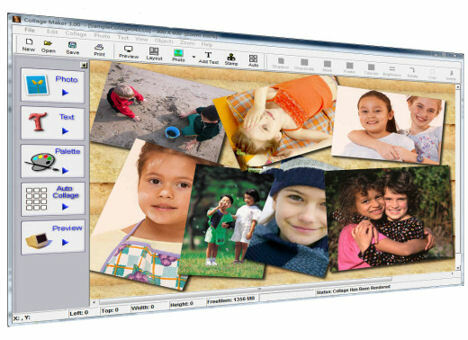 The Auto-Collage feature provides various Grid Templates which give the ability to create unique designs. The "Staircase" Template is demonstrated. Masks provide a means for applying border effects to your photos. Collage Maker makes it very simple to apply these masks. Halos can easily be applied to photos with or without masks. Qweas is providing links to Collage Maker 3.7 as a courtesy, and makes no representations regarding Collage Maker or any other applications or any information related thereto. Any questions, complaints or claims regarding this application Collage Maker 3.7 must be directed to the appropriate software vendor. You may click the publisher link of Collage Maker on the top of this page to get more details about the vendor.